Mountain view PENTHOUSE with large private terrace. A dream home for a family or a couple that needs extra space. Spread over 100 m², this bright penthouse offers three bedrooms, a walk-in closet, two bathrooms (one en-suite) and a magnificent terrace of approx. 42 m² on one level. The sun terrace overlooking the Tramuntana Mountains and Bellver Castle faces west and is large enough to accommodate a dining area or chill-out area including BBQ area. The bright functional kitchen is the center of the penthouse and combines dining room and terrace. The neighborhood has all the amenities, restaurants, shopping, schools, etc. you could need and the city center is only a 10 minute walk away. 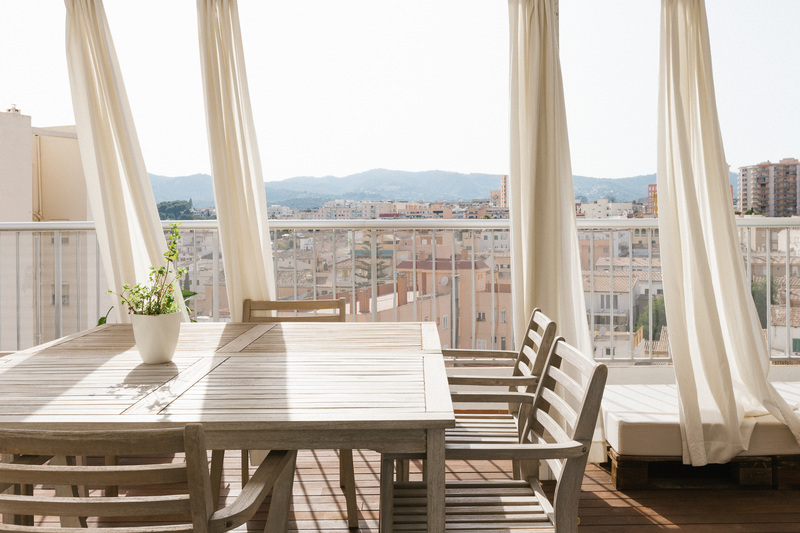 Completely renovated in 2013, the apartment has city gas, radiator heating, a handy lift, a separate storage room on the terrace, double glazed windows and high quality wooden floors. A comfortable home for big and small.